We travelled to the north of the island with Aquabus to experience Benirrás beach's world famous drummers and dreamy sunset. 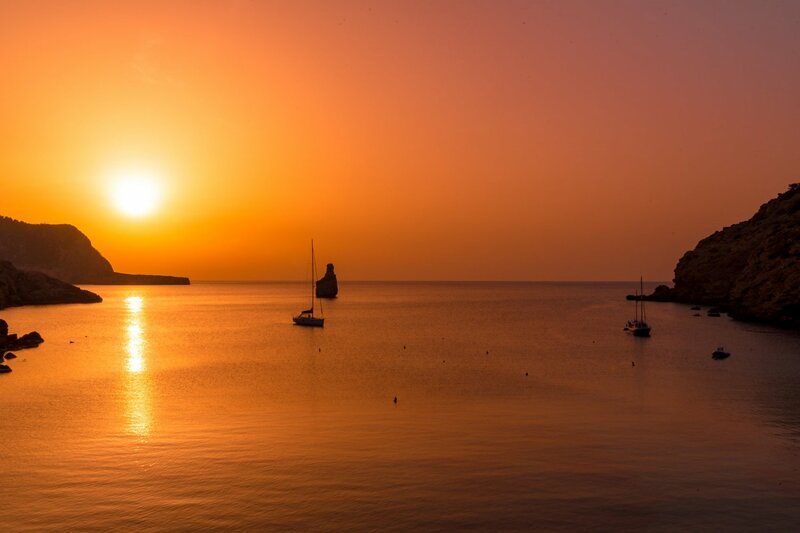 There are certain things you just have to tick-off the Ibiza bucket list. A Sunday excursion to experience Benirrás's famed drummers at sunset is one of the island's ultimate must dos. Being such a popular destination and so hard to park there Aquabus's boat trip to go and see it seemed the obvious choice. With the north of the island also quite a distance and many without access to a car, the Aquabus 16:00 waterbound shuttle service is an affordable alternative that offers unobstructed views of Ibiza's coastline. Starting in San Antonio and stopping in various places in the San Antonio bay, it's available to many. Boarding a traditional, hand-crafted Ibiza boat with dozens of co-travellers, the trip is obviously popular. With ample seating both inside and out you can chose to bask in the sunlight or shelter in the shade. A small selection of snacks and drinks are available on board, although you are welcome to bring your own. As we made further pick-ups along the west coast, it gave us food for thought on other beaches to visit another time. Clinging close to the coastline, we navigated between rocky outcrops and layers of sediment shaped by the elements over centuries. Further along up west coast it struck us just how untouched and unspoilt a lot of the north remains. A far cry from the hive of activity found in San Antonio. We arrived at Benirrás in early evening, with the sun still out in full force. At the southerly tip of the beach, the famed drummers congregated under the huts, their tribal beats reverberating from one end to the other. With an hour of daylight remaining, we took the opportunity to cool off. Swimming in the tranquil waters is incredibly refreshing and injected renewed vigour. As sunlight caught the tip of Cap Bernat in the waters of Benirràs, it created a divine glimmer; it was easy to understand why the towering lone rock has been nicknamed The Finger of God. As the sun edged ever closer to the horizon, the drumming intensified. With the BPM quickening and several attendees getting visibly lost in the music, we found ourselves swept up in the moment. Soon the entire length of the beach was on their feet and dancing. As the sun disappeared from view, the sky was awash with a kaleidoscope of colours. Purples, oranges and a deep red afterglow. Swaying in the warm summer breeze, the yachts anchored in bay cast a postcard silhouette against the glowing skyline. Coming from somebody who has seen his fair share of Ibiza sunsets, this ranked up there with amongst the most mesmerising I've ever witnessed. I wasn't alone. Groups, couples and even youngsters were stood in awe at this most ecclesiastic of natural wonders. There was a brief interlude as the drum beat subsided, and everybody on the beach shared a moment of united solace. Slowly the beat returned and night mode was activated. The yin and yang Ibiza is known for. After darkness fell, we still had ample time to browse the hippy market before our boat home departed. With lots of handmade jewellery, worldly garments and spiritual paraphernalia on sale, the stalls are well worth checking out whether you intend to buy or are merely curious. The ancient ritual of music and dance – as old as mankind itself – stirred something innate within us. Ibiza may be famed for its electronic music, but this felt about as representative of the island's soul than anything we've ever experienced in the clubs. On the return journey back to San Antonio, we got to see the coastline by night. Quite literally, seeing the landscape in a different light. With the stars glistening above us, it was no less than beautiful. This trip certainly lived up to its reputation. The Aquabus sunset trip links modern life with Ibiza's hippy heritage: a great experience of this authentic slice of Ibiza.